How Does Male Breast Surgery Work? Male breast reduction removes excess tissues to create a firmer, flatter chest. For men with excess fat and lax skin in the abdominal area, Dr. McLain may recommend combining abdominoplasty (tummy tuck) surgery with male breast surgery. Dr. McLain often uses pectoral implants to enhance healthy men’s existing pectoral muscles. Pectoral implants have the same risks associated with any implantable device. Fluid or blood can accumulate around the implant after surgery, which can require drainage. In some cases, the implant’s shape can become distorted as a result of scar tissue that thickens and tightens around it. Called capsular contracture, this condition may require a second procedure to remove scar tissue and replace the implant. Male breast surgery takes place with the patient under general anesthesia or IV sedation. 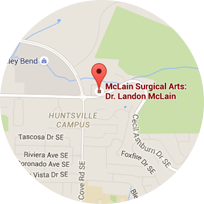 Depending on the patient’s needs, Dr. McLain will remove glandular tissue and/or perform liposuction to remove fat. In extreme cases, he will remove excess skin to eliminate sagging and create a tighter, smoother surface. Dr. McLain offers solid silicone pectoral implants. He places the implants under the pectoralis muscles through transaxillary incisions (made in the armpits). Since pectoral implants are solid, they require a slightly larger transaxillary incision than that used for breast implants.